Our technology and central monitoring approach allows us to dramatically reduce false alarms, but there are times where real emergencies or unresponsive users mean contacting local PSAPs to dispatch emergency services. In these cases, our highly-accurate location capability lets us reach the right PSAP, or other public-safety agency, and deliver vital information that can speed response. 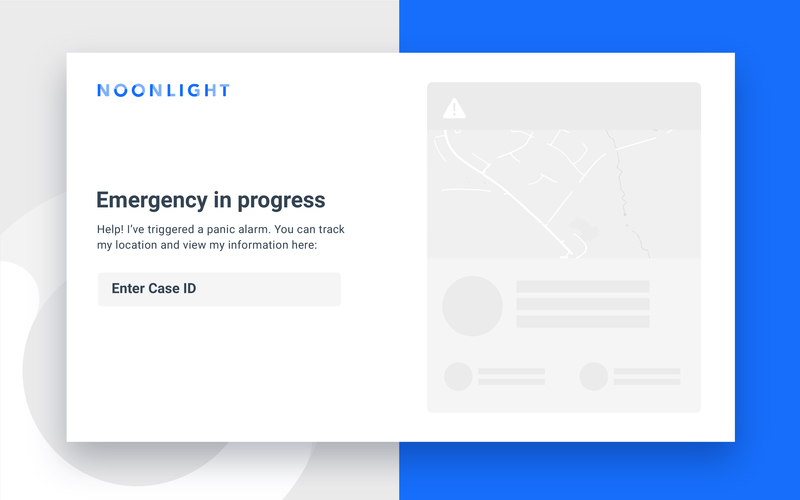 Noonlight dispatchers provide call takers with a description of the call type and caller, as well as real-time location data and other relevant information we have about the emergency. They will remain connected with your PSAP as long as requested. In addition, we will offer a unique Noonlight Case ID and short web address that PSAPs and responders can use to improve situational awareness and response. Entering a CaseID on our secure Web and mobile interface lets you join a "live" alarm. You will see highly-accurate device location data complete with live tracking as well as real-time SMS (text) communication and other critical caller profile and event information. This is completely free to PSAPs and requires no IT-support or software upgrades within your agency. All you need is a desktop or mobile device with Web access. Learn more about how we empower public safety at Noonlight.com/public-safety.